When I moved away from LA nearly 7 years ago, it was tricky to find decent late night eats. You were pretty much limited to a handful of fast food outlets (including my beloved Tommy’s), and a couple of downtown joints (The Pantry and Pacific Dining Car). Now, we can add 25 Degrees to that list. There are apparently three of these restaurants (2 in the LA area and one in Chicago) with three LA locations coming soon. So far, only the Hollywood location is a 24/7 affair. 25 Degrees bills itself as “Bordello meets Burger Bar,” which seems somewhat accurate given the rather naughty red wallpaper and chandeliers that adorn the interior of the Hollywood location and the wide selection of booze available. While there are a few other items on the menu, burgers definitely have top billing here with an assortment of fancy cheeses (mezzo seco jack!) and other high falutin’ toppings (tarragon remoulade!) on offer. Husband and I both made rather uninventive selections. His was the defined-for-you Number One (though the toppings were adventurous – caramelized onions, bacon, arugula, thousand island and the enigmatically named prelibato gorgonzola and creszenza cheeses). While I displayed a bit more creativity in selecting the Build Your Own Burger option, I let the team down by choosing rather mundane toppings (gruyere, mayo, tomato, lettuce, onion, pickles). In my defense, though, it is a standing rule of mine – on first visit to a burgery (I have just decided this is a real word) – to try the either the eponymous burger or, in absence of this, a pretty basic offering. I consider this a pure approach to trying a burger and, happily, really easy to sort out at 2 am after what feels like a bazillion cocktails. Both burgers had ginourmous fluffy buns, and that rather odd cheese combo on Husband’s burger actually worked pretty well – for some reason, it reminded me of nacho cheese (but in a good way). The burgers were juicy but without much of a meaty flavor – I found the bites I took without the toppings to be a bit better, as the beef flavor was more emergent. 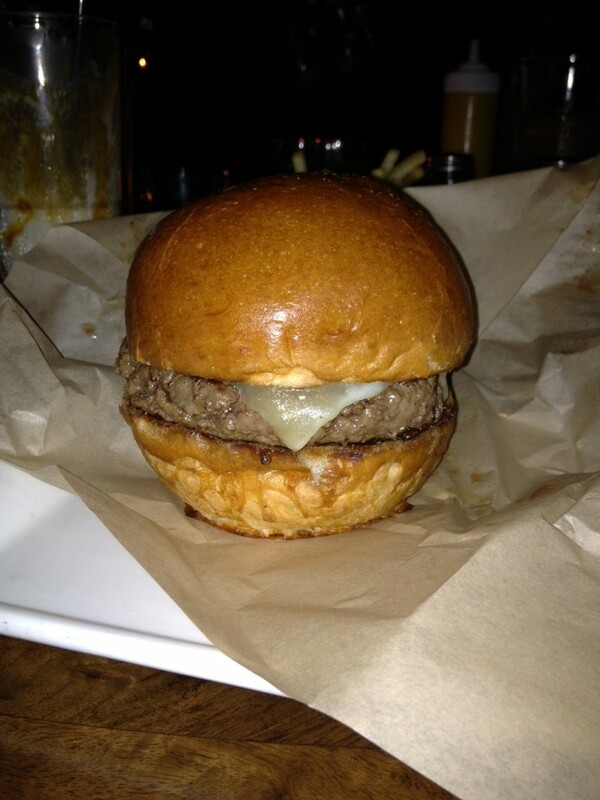 The gruyere on my burger was oddly flat and not very discernable. The fully-loaded burger was nicely balanced but I did find it odd that nothing particularly stood out from a flavor perspective. I should mention that we also had fries and a Salty Caramel spiked milkshake. The fries were plentiful and rather creative, featuring a coating of rosemary. The shake was definitely hard, but not especially rich or particularly tasty. Price: $12 for the Number One, $9 (before toppings) for the Build Your Own Burger ground sirloin option, $4 for fries, $12 for a Salty Caramel spiked shake. Not the cheapest after-hours snack. Destination Burger: Unclear at 2 am after many, many cocktails, but a definite “yes” should you find yourself in similar circumstances. Optional French Fry Rating: Loved the thin slicing and crispy texture, but the rosemary made the fries taste oddly grassy. Fat and Calorie Worthy: Yes, especially in the wee hours of the morning. Today’s Weigh In: Plus 3 lbs, which is a freakin’ miracle considering the carnage of my two week vacation.